The Courage to Say Hello – Beyond H.E.L.L.O. 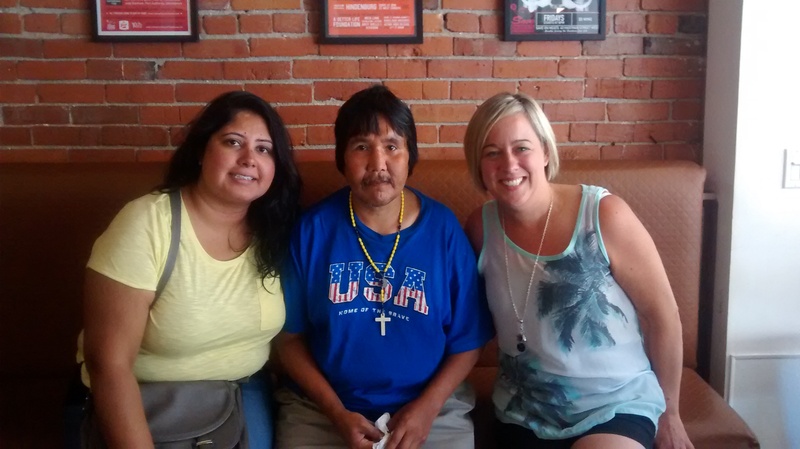 Changing the Perception of Homelessness One Story at a Time. Why is it that sometimes the ones we love are the hardest to reach out to? Lost in our own feelings of doubt or insecurities, all of us use silence as a way to protect ourselves. Worried about what others may think, we play it safe and avoid difficult conversations. Sometimes it takes courage just to say hello. Today was an amazing day. My friend Soni and I headed to the streets of Vancouver’s Eastside to hand out water to the homeless during the mid day heat. After some friendly conversation and banter with the livelier than normal people on the streets, we met up with my dear friend Ron Wilson in Pigeon Park. Ron, a professional boxer from years ago, joined my family for lunch two years ago. Whenever I visit the DTES, I find him on his bench and say hello. (click here for a previous post about Ron) I sat down beside Ron and let him know that my blog post about him had reached an old friend of his from California. I read him the message and together we reminisced about his fascinating life story – a timeline inclusive of professional boxing, owning a tire shop and opening a bar. On the other side of the park bench, Ron’s friend Norman sat beside him. I asked Ron if he had had a chance to call his daughter since we had last spoken. He looked at me and said no, he couldn’t because he doesn’t have the number. I read an email to him from his daughter encouraging him to reach out. He smiled knowing he has three grandchildren, and once again I wrote down the number for him. He plans to call. Just not today. A wave of shame clouded over and Ron decided to head home for an afternoon nap. As we said goodbye, I asked Ron who he thought might be hungry for a warm meal. Ron said he wasn’t sure as he started to look around the crowded benches in Pigeon Square. Quietly, his friend Norman spoke up and said “I’m hungry.” Soni and I asked Norman if he would like to join us for lunch at Save on Meats. Norman accepted, and so together we said goodbye to Ron and headed for lunch. As we walked up the streets we learned that Norman was from Edmonton, but has been living in the SRO low income housing on East Hastings Street since 1997. He has ventured back to Edmonton a few times to visit with his mom. 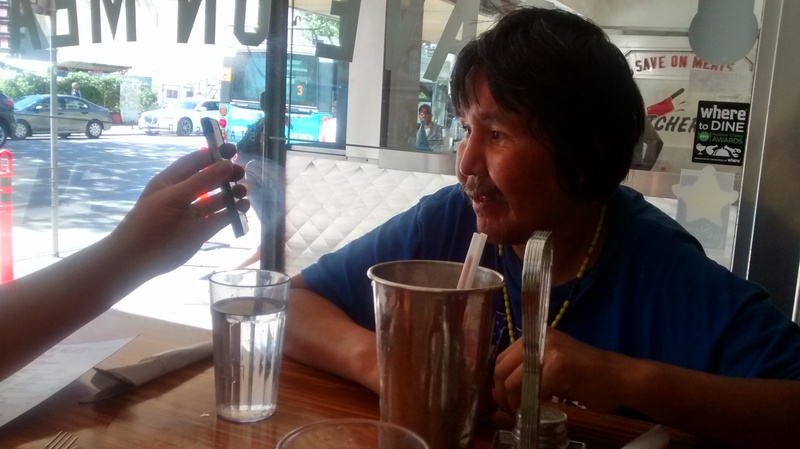 Despite the harshness of the Downtown Eastside, Norman is a positive guy, gentle in nature who only has nice things to say. He loves Vancouver and is happy despite having so little. Norman is hungry and appreciative as he orders a strawberry milkshake and a double bacon cheeseburger with fries and gravy. I asked Norman if he has any children. Quickly he replied – “yes, two boys, age 5 and 19.” I asked if he gets to see them much. As he looked down he told us no – he has not met them. With a hint of optimism he let us know that one day he hopes to meet his sons. I asked Norman if he would like me to help find them. Shame took over and he mumbled a polite “no thank-you” and you could tell is was too difficult of a topic. Lightening the conversation we joked with Norman about his age, saying we would never of guessed he is 49 years old. Wrinkle free he appears much younger than he is. As he ate his burger, Soni and I talked about our summers. As we wished each other a happy birthday, I remembered I had a story to tell her. I said to her “Hey, guess who phoned me on my birthday this year?” Stumped, she asked me to tell her. I let her know, that for the first time in 21 years, my own bioligical father had called me to say hello. We talked about the moment – I explained I was out hiking with my boys and my cell phone rang. On the other end, a man’s voice I did not recognize said “Hi Kristi – it’s your dad. I wanted to call and wish you a happy birthday.” Soni asked what it was like, and I explained that it was actually really nice. I told her that if I had known he was going to call I would have analyzed it, wondered what to say, etc, but the simple act of a birthday phone call was a pleasant surprise. Many years ago I accepted that my dad was not a part of my life but the phone call felt good, and helped heal a wound i did not know was there. Despite the history, just knowing he thought of me on my birthday made me smile. Norman listened with compassion and empathy and asked me what it was like to hear my dad’s voice. He mentioned to us that his oldest son’s mother had contacted him this past year and said their son wanted to meet his dad one day. I asked what his son’s name was, and used my phone to see if he was on Facebook. In an instant I found his son’s profile. We asked Norman if he would like to see a picture of his son. Right away he said yes. We asked if he was sure, and his eyes began to sparkle with the anticipation of an expectant parent. I reached my phone across the table and for a long moment, we sat in silence as Norman saw his son for the first time. When i put the phone down and we began to talk again, Norman asked if we could go back to the photo . With wonder and love he repeated, “can I see it again, can I see it again?” Like a new dad wanting to hold his newborn in his arms, Norman wanted to hold my phone. Beaming at the noticeable resemblance, we held the phone with the profile picture cheek to cheek and we used Soni’s phone to take their first photo together. We asked if he would like to reach out and send his son a message. With confidence he said yes, and together we drafted a beautiful note, letting his son know he hopes to travel to Edmonton soon to meet him. As lunch ended, his son had yet to receive our Facebook message and so we said goodbye and promised to be in touch. Smiling ear to ear, Norman let us know he never thought today would be the day he would see his son for the first time. Just an hour later, Norman’s son contacted me. Overwhelmed by the news, he let me know it was a lot to take in. I explained our Beyond HELLO project and told him that if and when he is ready, we can help him connect. 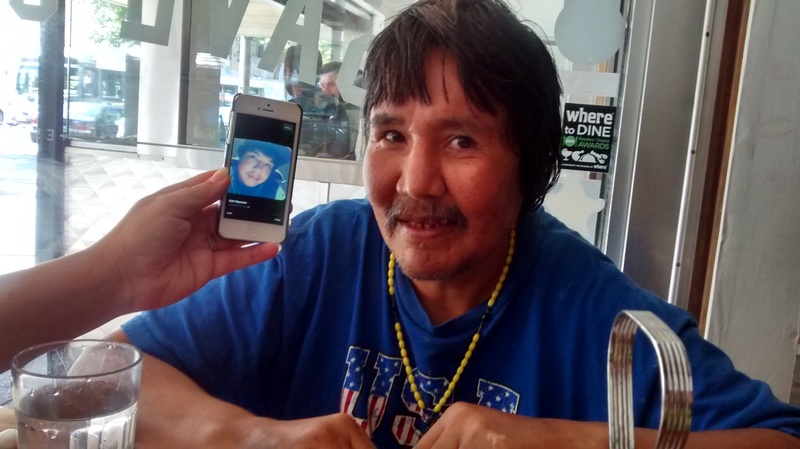 Within minutes, he replied that he was ready, and together we decided that Soni and I would head back to the DTES to reach Norman this Thursday so they can have their first father son phone call. After 19 years of silence, Norman has found the courage to say hello.